surprising random sheep at footpath five. suspected we had half a dozen of them. Thanks to all concerned for this weekend's efforts. A pleasant day with the main activity being another Steam Experience Day hosted by Neil Hardwick, Bob Grange and John Evans. Our three participants enjoyed their time with us but were blissfully unaware of a growing coal crisis as a delivery promised for Wednesday finally arrived around midday today necessitating emergency supplies at highly inflated prices from a local coal merchant to keep the show on the road. There is nothing straightforward in this life and I am very grateful to Joe Ruddock who hung about for four hours to unload the one tonne bags by our fork lift. 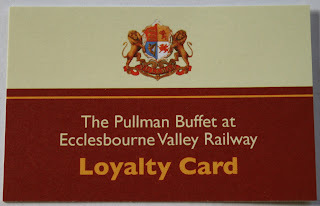 The Pullman Buffet Car benefited from the slightly better weather and I met another regular that recognised the fact that the facility was open seven days a week and enjoyed his second breakfast of this week. The Booking Hall continued preparing for the upcoming diesel weekend which we trust will be a financial success. The dmu team achieved the first gloss coat on the Bubble Car taking in the west side and cab ends. A photo is attached courtesy of Leigh. An update on our poorly Operations Manager has seen him returned to home for at least a week of bed rest with a goodly supply of antibiotics. Amazingly it has been a fairly warm and sunny day lifting the spirits as we welcomed back one of our experience customers previously disappointed by a sudden failure of No3 a couple of weeks ago. Today restored our credibility and the participant and his wife were well looked after by Dave Williams, Hylton and John Evans. The Bubble Car makes swift progress with Mike and John Allsop with the roof completed and much activity with the green bodywork. The PWT completed the boxing up of the Road 2 relay commenced by the students at the weekend and the end product looks very good reflecting great credit on our team. The VCT have had quite an exciting day with lively debates with our neighbour near MP 1343/4 following a substantial breach of the fencing. The day ended more amicably and the holes have been dealt with. They were also warmed by a two fire day. Most of our neighbours are very appreciative of the VCT's work and it is to hoped that this farmer has reflected on his approach to life. There was continued progress with the maintenance of the dmu fleet and assembly of the weekend trains plus Monday's charters. The Booking Hall and Pullman Buffet Car benefited from the more clement conditions. I know it's getting boring but the weather today was truly dreadful with unremitting rain until about 1600 when it brightened up for a minute or two. The very brave and adventurous PWT set off for the south to dispose of sleepers beyond reuse and managed to clear around fifty of these to rot in peace. They also managed to achieve two loads of logs for sale and have cleansed the area south of Hazelwood which also has the effect of leaving less ammunition for those who might consider it fun to put them on the line. The LCC tackled the 2 Car service unit before resuming her quest for suitable presents for our Santa train participants. The Filing Fairy made very solid progress with our records which are becoming the gold standard for the heritage railway movement. Further steady progress was made with the Pullman Second Open lighting and heating project. Amazingly the Pullman Buffet Car welcomed a reasonable number of visitors and the Booking Hall pursued creative marketing ideas. The progress with 55006 is shown with another burst of painting promised tomorrow. PS - JHT was wrongly credited with working in the rain yesterday - it should have been Doug Futter who got the applause! A dank, dismal and very wet day marked our final Tuesday service of the season. I am very grateful to the train crew and particularly to Rodney who undertook the task of third man who became totally soaked by the end of the day. Our support of the two Booking Halls, the Pullman Buffet Car and the EVRA Shop tried their best to extract a little revenue with limited success I'm afraid. The PWT in the shape of AW, HH and JHT patrolled the whole line in less than clement conditions but the DST were undercover as they flattened down Henry Ellison for repainting. Mike Evans and John Allsop made impressive strides with the Bubble Car undercoating both the roof and two thirds of the west side. A lone LMSCA worker tested a process for cleaning the floor of the Third Open with some success and also applied more emulsion paint to negate the fire damage smells. This labour of love will pay dividends over the next six months as we earnestly wish this coach to return to our operational fleet. There was much work in atrocious conditions to assemble the rolling stock for the weekend and we learnt today that Tom Tait had been taken to hospital with suspected pneumonia. Needless to say we all wish him well for a very speedy recovery. PS - I can't resist a feeling of parental pride as my son has been appointed Head of Marketing Communications for the Ordnance Survey. I've always wanted a full set of the 1" to the Mile, or its metric equivalent, and it seems within touching distance! I am clearing the necessary shelf space. An atrocious day today with endless downpours but nevertheless pwt managed a few tasks. Hylton and myself ballasted 2 road relay at Wirksworth and then went on to shunt the train in readiness for wed entertainment. Further tasks included coaling No3 as a late finish on Friday meant this wasn't too popular at the time. In addition to this a full 6 monthly inspection of Gorsey Bank and Idridgehay level crossing was carried out as well as lubricating the hindges and oiling the locks. like a nice bit of wood. 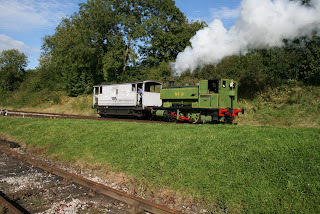 A warm and sunny day down at Derbyshire's favourite branch line brought out good numbers of visitors to our railway. Starting at Duffield we had a number of passengers travelling on through tickets from as far as Leicester. At Wirksworth we welcomed a day with the driver guest from Warwick. The miniature railway was open and continues to attract younger visitors. Down the training room three courses were delivered:- First Aid, Personal Track Safety and an Induction course which was very well attended. A warm welcome to our new volunteers and hope they have a long and happy association with the railway. Down the yard the DMU quick fix fitters successfully rectified a fault with Breeze's battery wiring as well as undertaking an annual inspection of the centre car. The restoration team focussed their skills upon the Guard's van panels and trim of the bubble car and a small band raided Aunty Wainwright's coach for spare doors and found a surprising assortment of said objects, photo attached. Not the easiest of our experience days as we had both a Drive a Diesel Day and a Steam Experience all ably hosted by Mick Thomas, Joe Carver on No3 and John Allsop, David Newby on 33035 with John Evans effortlessly moving between the two. The slight strain during the day was the sheer number of relatives that were following one of the steam participants who discovered that Wirksworth Station on a dank miserable day did not add to their enjoyment of life and, having been pre-warned that it was not an ideal ambiance for young children brought three of them including a baby. We were doomed! Nonetheless, the Booking Hall and Pullman Buffet Car played their part in damage limitation. There was further progress with the Bubble Car and much washing, fuelling and tending to our operational fleet through the day. Graham and Doug wrestled with the alternator on LJB which proved to be in good order but charging of the battery remained a problem. I hope their ministrations reached a successful conclusion. David N continued his Forth Bridge work to ensure the Pullman Second Open has light and heat through the winter. Doug also continued with his task of oiling axle boxes and brake rigging of our various freight vehicles, quite a vital task if the occasional movement of these pieces of equipment are not to cause problems. The VCT worked some 150 yards south of Jebbs Lane bridge reported two huge fires despite there only being a four man team. The Pullman Buffet Car and Booking Hall had a steady footfall and there was further work done to select products for our online shop. We hope to put a few selected items that may be tempting stocking fillers for the Christmas period! A fairly gentle autumnal day of sunshine and showers. There was a warm glow of satisfaction within the DST who were most pleased that Henry Ellison was passed as fit by the boiler inspector. Two steam locos restored to life in our less than pristine workshop conditions is a magnificent achievement and Bob reminded me today that a great deal of behind the scenes went on because most of the vital castings were stolen and copies had to be made which was an expensive and time consuming process. It is a credit to Craft enterprises that one way or another the funds were found for these tasks. The PWT continued fettling the area relaid by the Birmingham students recovering our very last reusable sleepers from the Ken Rowlands area. A very early text message announced that Watt Track Patrols were in action at the crack of dawn. Now there's dedication. The LCC had a most productive day tending to the 2 Car set, Iris, the Training Room that for some reason had a deposit of charcoal and further deep cleaning of my abode. I did remind her that this made up for the one day's holiday she had taken this year which didn't seem to be appreciated. Work continued in the Pullman Second Open to provide heat and light during the winter and further inroads to the Bubble Car renovation were made. Cut vegetation was moved from Duffield to Hazelwood for the VCT to burn. The Booking Hall and Pullman Buffet Car welcomed a few visitors and with the benefit of Robins work the Railway Guide is available on line in a more obvious way - just have a look at the online ticket sales section of our web site. 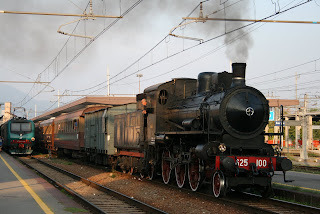 Lastly, I couldn't resist a holiday picture as I witnessed one of the very few steam excursions to operate in Italy, a return excursion from Paratico Sarnico to Milano departing from Bergamo on Sunday 9th September. Picture taken by Beverley as I failed fiddling with the video camera! The momentous event today reflected immense credit on the DST as Henry Ellison became a complete steam engine again and moved under its own power for the first time in 42 years. There are many unsung heroes in this magnificent achievement made possible by sheer determination without benefit of drawings or a spares manual! Our picture today shows the proud team and they await the final verdict of the boiler inspector tomorrow. The DST also gave No3 some routine maintenance for its further work on Friday. Meanwhile we had another quite successful Tuesday with services carrying creditable loads and Bachmann being amongst us to record our dmu fleet in action so the sounds of EVR will resound around the world of those who host dmus on their model railway. The LMSCA made further solid progress with the new window sizes in the brake compartment for the BTO and successfully produced a prototype steam heat pipe for the coach. Mike Evans worked quietly to progress the "Bubble Car" with the new north end cab roof put into position. This vehicle is going to be another star of our collection in the not too distant future. Fred & Iris were welcomed again as they deep cleaned the Mess Hall which looks a treat again. I enjoyed a catch up after a week away in the deep cleaned office courtesy of the LCC last week which was much appreciated. The Buyagift products still are producing very good results for us with the first two bookings taken today for 2013. The Booking Halls and Pullman Buffet Car greeted our many visitors today to good financial effect. Yet another sunny day for us on Monday. P way have more or less completed assembly of the track dismantled by the students over the weekend with just one small panel to assemble then packing, lining and boxing up will complete the job. VCT were down to 2 subjects but still managed 1 fire working between Jebbs lane and Barnsley lane. Mike Billings has been out with the flail in the same area and managed about a 1/3 of a mile. Weed kill team were lost with no weeds so joined the P way team for the day. Dave Newby gave the buffet his further attentions and visitors to said emporium were reasonable given the time if year. accumulated rubbish by a passing resident of Sutton on the Hill. who said he would like to be awarded something large and woody. reminder to Guards to adhere to the timetable at intermediate stations. A fine day at Wirksworth today with PWT completing the drainage work in the North yard. Seized fish bolts were also cut out in preparation for this weekends relay.A new check rail was manufactured and fitted to the turnout on the incline owing to excessive wear allowing vehicle wheels to hit the xing nose. All the unsuitable material left for lighting up steam locos was removed beyond cemetery lane bridge for disposal. A note here, we only require real timber for lighting up locos such as pallets, old timber window frames, floor boards, skirting boards etc. Please no sheet material such as plywood, chipboard, hardboard, partical board and the like as these are useless and cause us time and effort to dispose of. Please take them to your nearest tip not to us. Thanks. Neil hosted one of our shareholders from America today running a train for him to Duffield which resulted in our coffers expanding somewhat and Neil may like to expand on the days outing. VCT again in action at Hazelwood with the down side of the first straight South of the Station now cleared to the ground - about 1/2 mile. Mike Evans was in attendance putting more effort into the bubble car roof with the rest of the DMU group spending the rest of the afternoon fueling and shunting the stock for this weekends operation inti position to avoid conflict with the pending relaying work in the North yard. Today started with the PWT travelling to Shottle to pick up some piping to enable them to progress their drainage work in the yard. The lone carriage cleaner tackled Iris then spent most of the day deep cleaning the General Manager's office. Our filing fairy was in attendance and has completed an up to date matrix of training records. Dave N continued his work on the Pulman Buffet's electrical supply. This afternoon we welcomed a group of Managers from East Midlands Trains who were on a team day out. They enjoyed a buffet lunch before taking the opportunity to take the controls of the Class 33 and Iris as well as visiting the model railway or travelling on the narrow gauge. Finally, five guards attended a course at Duffield Station on guarding loco hauled trains and run round procedures. our operational units looking presentable. up fishbolts for this weekends relay in a get up that can only be described as a fish mongers green plastic apron and orange overalls covered from head to foot in a kind of oily , parrafiny, greasy sort of gunge. The sacrifices made to save the company a bob or two know no bounds. in the yard at Wirksworth. However much was achieved with the level crossing near the shed extended Southwards, a new drain run excavated alongside the single slip to prevent the switches flooding and then freezing into a solid block of ice this winter, fishbolts freed off on this weekends relay on 2 road, all chairs and screws moved to site for said relay, a start made on the carriage road extension and the ground frames at Duffield adjusted to rectify non compliance after last weeks inspection. Weed execution team pulled up weeds on the incline and then spent some time winterising there vehicle - anti freeze etc. Buffet was busy with stock deliveries and customers. Lots of shunting to free up Ellison the steamer in order to extract from the shed on Tues and making up the coaching stock for Wed charters. VCT were busy at Hazelwood in spite of their efforts being slightly curtailed due to train operations still managed 2 fires. A lone personage(Rodney) spent the day at Duffield repairing the mower and cutting the grass. A rather bohemian atmosphere was evident today at Wirksworth Station as we welcomed exhibitors and visitors to the annual Wirksworth Festival. Our passenger services were busy throughout the day with a high number of first time travellers enjoying the vistas of the valley. Down the yard the LMS Carriage Association were busy with a number of chores including some welding in the brake open third. The LMS brake van now has one side of its runner board fitted. Tim Oaks and a small band of merry men continued their salvage operation at the Denby Branch Line. This evening we ran the inaugural Skiffle and Chips train which was an unqualified success. Due to the event being fully booked Iris was coupled to the three car set to provide an additional 18.20 service for festival visitors to return to Duffield and onwards. Leigh Gration et. al. deserve our special thanks for organising an excellent evening which I hope will become a regular and very popular special event. A most frustrating day as our steam engine, No3, failed at the last moment after our guests had arrived. Much grovelling and apologies endeavoured to rescue the situation but I have invited the steam team to consider how we might deliver what is promised. Nonetheless, progress was made with the shore based lighting for the Pullman Second Open and various folk were delivering parts of the Wirksworth Festival to the Training Room and Second Open. Despite our set backs the Pullman Buffet Car and Booking Hall benefited from the foot fall through the day. Quite a remarkable happening was the fitting of a carpet in the Class 119 and many thanks to Leigh for supplying the accompanying photo. Sent in by Vince Morris to say we have truly arrived with a mention in Private Eye! "You will be pleased to know that we have made it into the big time. Our now famous sign at Wirksworth Station: "Extra Ladies are available around the corner" which first made the national press in an article by Matthew Parris for the Times, has now popped up in a photograph published in the current issue of Private Eye (issue 1322, page 14). Now that is fame! The location is given as Ecclesbourne Valley Railway Station, Derbyshire, so if you spot any keen satirists charging around Derbyshire looking for "a station" you will know which one to direct them to." A lovely day with the sun beating down to lift all our hearts. John Allsop turned up early to apply some Pullman Umber to the Buffet Car doors that open onto the Ravenstor line for ventilation when the climate permits, which you have to say is not often, and had been missed in the initial interior refurbishment. The VCT were not able to travel to site because of our other activities today but managed to clear some 30 yards on the Up side and 10 yards on the Down side just south of the Hazelwood pig farm achieving one large fire. 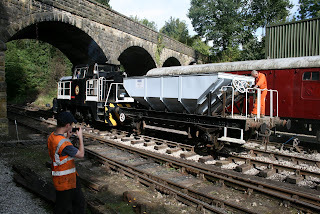 The PWT loaded a Dogfish with ballast in preparation for the work to be untaken by the Birmingham University students the weekend after next and then went on to tend to matters in Wirksworth Yard. I also managed to catch up with their unreported progress this week which included a full service and routine maintenance of our ground frame installations at Shottle and Duffield. Yesterday saw much progress with the Shottle loop project where 12 pairs of fishplates were greased, the replacement switch blade to delivered to site at the south end of the loop and fettling and levelling of loop line and through the station on the "main" line. There was much dmu maintenance, fuelling and general preparation for the forthcoming Festival Weekend. Catering supplies were also unloaded in some bulk for the Weekend. We hosted two charters to "sweat our assets" today. The first being a Ravenstor trip followed by a return to Duffield for a 40th birthday where champagne was broken out from a cold box on the Duffield to Wirksworth leg. There then followed a coach group from Essex that had been on tour in the area for a week who thoroughly enjoyed their time with us. We also managed to pick up a few other visitors for these journeys to our financial benefit. As a result of this passenger activity the Booking Hall and Pullman Buffet Car had a successful day resulting the night safe being visited at the close of play. My thanks go to all concerned including the train crew of Lewis, Richard B and John Tedstone who worked their magic on our visitors. My thanks also go to Robin who has put our new Guide onto the web shop - look in the ticket area! 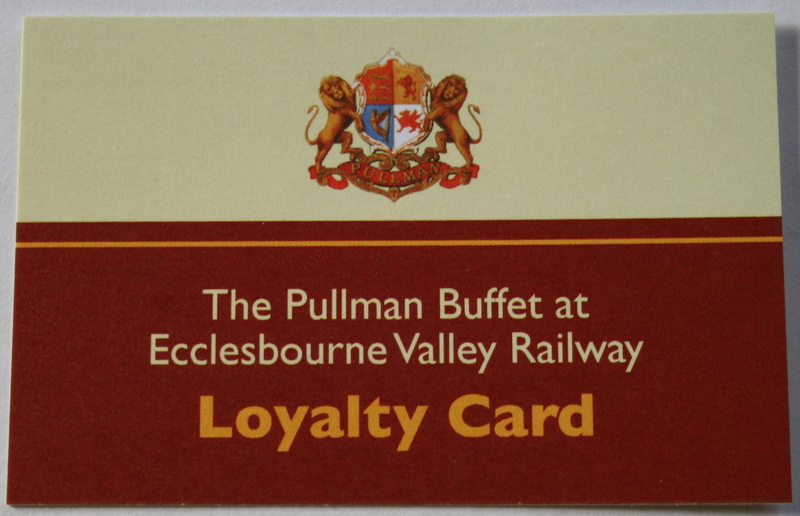 Also, a new product is available in the Pullman Buffet Car - a Loyalty Card - just call in a pick one up - you know it makes sense. A report today that is a little vague as I had to leave the premises for most of the day. Further and better particular details will be given tomorrow. 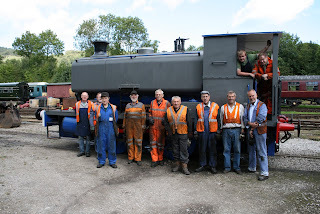 Nonetheless, I do know that the PWT devoted their attentions to the Shottle loop project which involved the road/rail Landrover together with LJB and the works train that resulted in quite a long day for all the participants. I am grateful to Mick Kingsley who undertook further strimming of the area around the concessionary footpath at Wirksworth as he tries to get it into a condition that it can be mowed. The LCC had no trains in position so concentrated her efforts on the Training Room where the carpet was very wet from a continuing problem of the roof seals between the two sections of the structure. The Booking Hall and Pullman Buffet Car benefited from the pleasant weather and welcomed a few people to our enterprise. Unsung heroes were the EVRA team that have been repairing the toilets in our Second Corridor (SK) coach that will see some productive use next week. A delightful day with the sun warming us as visitors descended on our Railway. There was a feeling of relief as the children were back at school and we adults can go out and about without distraction. Our service was operated in its entirety by Iris and relief clerk Shone started his day at Duffield to capture the early travellers returning to base after the initial rush. 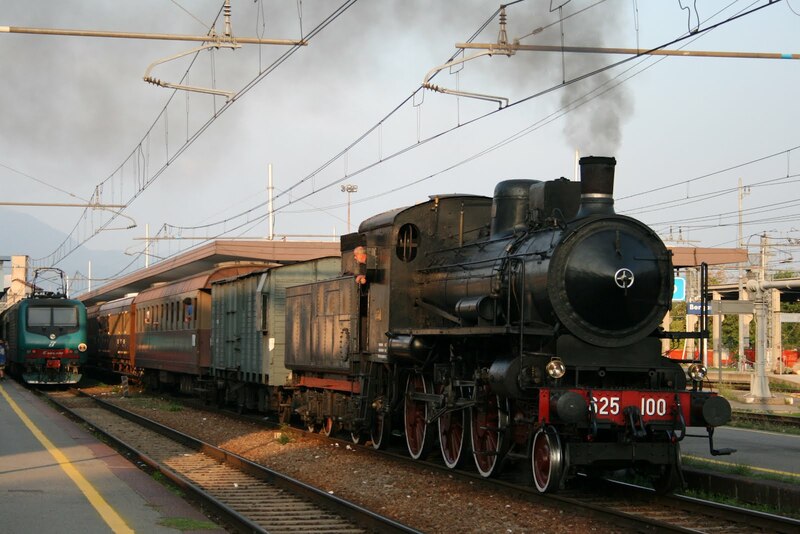 The Pullman Buffet Car had a most successful day with our passengers and an ever growing band of users that want to relax in its pleasant atmosphere. The EVRA shop also had a very good day and we welcomed a long distance enthusiast from Barnstable who was "doing" the transport delights of Derbyshire. My thanks go to David N who fitted a door within the Pullman Second Open to keep our stocks secure and Fred & Iris who restored the Mess Hall to some semblance of normality. The LMSCA began to tackle the adaptation of the large guards compartment in the BTO to a smaller guards area and a greater passenger portion suitable for the less able. This involves replacing small windows with "normal" sized ones. The Filing Fairy journeyed from Long Eaton by public transport enjoying the easy interchange at Duffield and made much use of her time with us to continue the "Forth Bridge" of record updating. The DST made further inroads to Henry Ellison's reassembly reporting that the whistle is now fitted with its associated pipework together with an number of "snagging" tasks. No3 was treated to gland replacement for the regulator and steam brake together with a good clean. 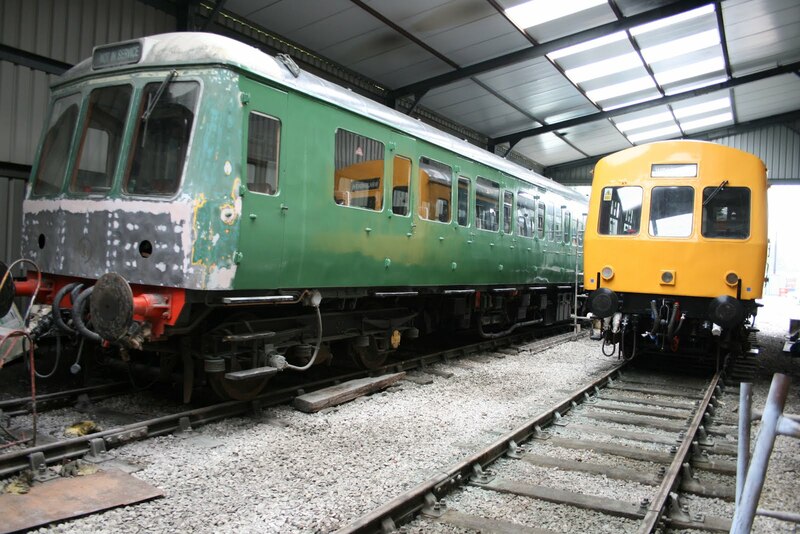 The dmu team were very pleased that all their efforts with 51360 that included the replacement of an engine proved to be successful. This work is not done in a clinical workshop but outside in indifferent conditions so deserves a lot of credit to return one of our stalwarts to service. The Booking Hall at Wirksworth sold with vigour including our splendid new guide book which is flying off the shelves. This will soon be available on line! PS - We seem to have a hi-viz crisis as our cupboards are bare. If any of you have hi-viz vests doing nothing we would be delighted to receive them. PPS - Patrick McCloughlin, our MP, has landed the job of Transport Secretary. His last journey with us was with Faraday and a Brakevan some 10 years ago and I have invited him to return for a more salubrious journey. Progress Monday 3rd September 2012. Yet another glorious Monday allowing PWT to weld and regrind the switch blade on the sturgeon at Wirksworth. This switch is destined for Shottle South loop point as the the one in position is damaged at the toe and badly side cut for most of it's length- in other words destined for the scrap pile. Other PWT jobs include refurbishing the bolts needed to install the aforementioned switch, a little light shunting to recover empty wagons from the car park and lubrication, inspection and FPL check on the ground frames at Wirksworth. VCT had a positive day at Idridgehay and Jebbs Lane with two fires and much flailing with the Komatsu between Idridgehay and bridge 11. Bob the builder a.k.a. Dave Newby was busy fitting door frames and doors to the interior stock rooms in the station buffet to prevent stock going walkabout. Weed kill gang carried out a final cull of weeds from Wirksworth to Callow Park cutting and have now used up this years allocation of weedkiller. Buffet had a few visitors in the morning to swell the coffers a tad and a positive day was had by all. Alport turn-off: quite a creditable outcome for a routine Sunday. reconditioned engine which had been put into the class 117 power car. probably win an award for its exhaustive and careful restoration. A busy day at Derbyshire's favourite branch line. Starting at Duffield, the station team were engaged in cultivating the lawn in between their normal passenger related duties. Our train services ran up and down the valley with fair passenger numbers on all trains. Interestingly we are now welcoming regular passengers on our 10.20 Wirksworth to Duffield service each Saturday who are travelling to Derby to shop. Also on the 11.10 Duffield to Wirksworth service we welcomed passengers from Nottingham and Long Eaton travelling with through tickets from East Midlands trains. The Wirksworth yard was a hive of activity with the DMU team installing a new engine in 51360 as well as attending to the task of preparing the class 119 in readiness to fix the seats into place.The LMSCA have finished the emulsioning of 162. Work continues on the LMS brake van with more planing and chiseling. The narrow gauge, miniature and model railways were all open to visitors today and we played host to a group of photographers from Ocean Hampton who were revisiting the line, cameras in hand, following their private charter last year.